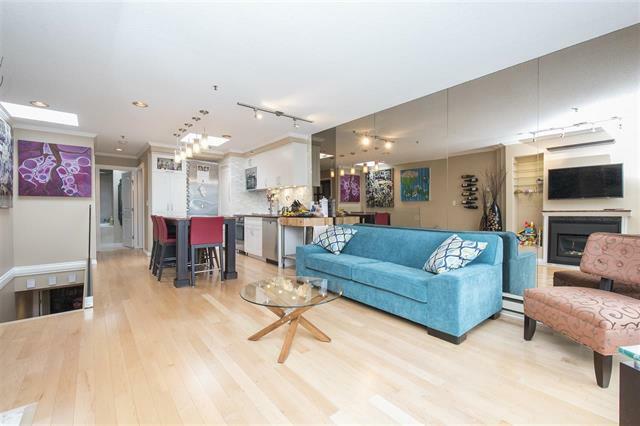 Gorgeous water, downtown and mountain views from this 2 bedroom, den & 2 full bath, 3 level, end unit townhome in boutique 11 unit complex. Fantastic open living space on top floor complete with stainless steel appliances and gas fireplace which leads onto spacious deck. Perfectly located on the West 7th bike route which has now been closed off to thru traffic! Steps to the overpass to Granville Island & False Creek seawall. Blocks to services at Cambie Street including Whole Foods, Liquor Store, Home Sense, restaurants, skytrain, etc. Complete with 1 secured parking stall. OPEN HOUSE SATURDAY DECEMBER 1ST 2-4PM.